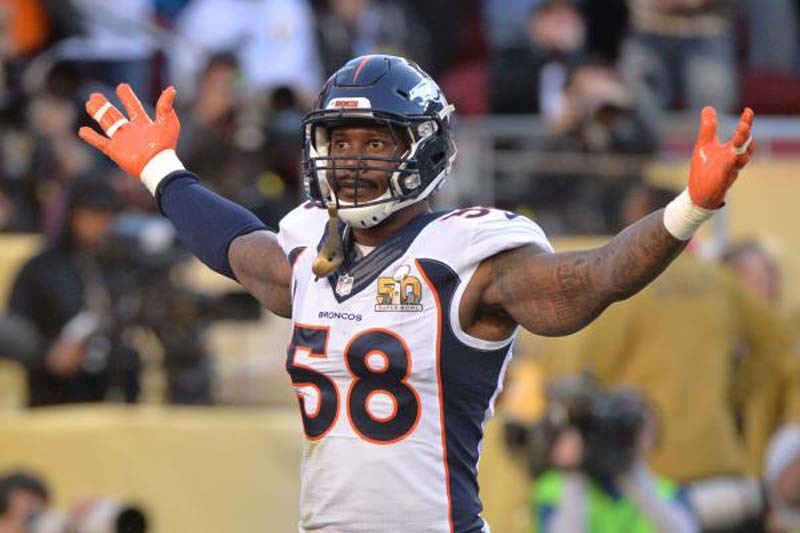 Denver Broncos linebacker Von Miller is entering his eighth NFL season and sees no end in sight to his playing days. In fact, Miller told The Athletic that he could be pushing 40 before he is ready to walk away from the game. "I feel like I can get 10 [seasons] in me. Maybe even more," said Miller, per the website. "I'm just going to take it one year at a time and see what I can do." Miller, who turned 29 in March, has developed a legendary conditioning routine that includes personal trainers and chefs to keep him at an elite fitness level. The No. 2 overall pick in the 2011 NFL Draft, Miller acknowledged that he didn't always follow such a regimented approach, relying on the natural talent that produced a career-best 18.5 sacks in 2012. "Then I tore my ACL, and it really knocks you down to reality, and my perception changed and my priorities changed." That injury occurred midway through the 2013 season, the year after he amassed 18.5 sacks and earned first-team All-Pro honors for the first time. "I wanted to get back and I wanted to grind and get back to a level that I was and surpass that. I knew my nutrition and my training and all the other stuff that all the other guys do to help me get ready, that's some of the stuff I needed to do. It started with a chef and training and now I've created this whole lifestyle." Miller has been named to the Pro Bowl in each of the four seasons following the injury, adding two more first-team All-Pro honors along the way. He registered 48.5 of his 83.5 career sacks in that span and was named Most Valuable Player in Denver's victory over the Carolina Panthers in Super Bowl 50. Miller's peers recognized his long run of stellar play. On the NFL Network's Top 100 list this year, he was voted as the league's No. 9 best overall player.